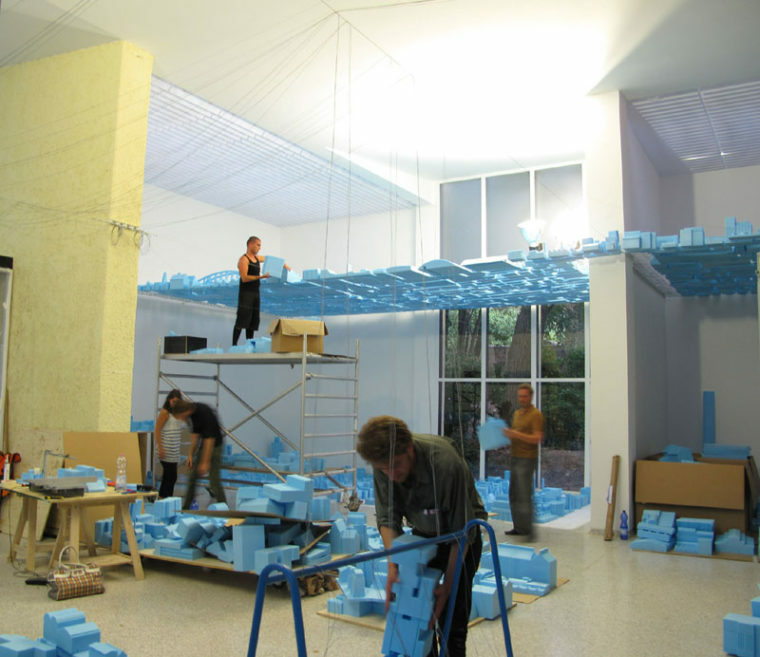 In early April 2010 my brother Erik Rietveld and I were approached by the NAi and asked if Rietveld Landscape wanted to act as curator of the Dutch pavilion for the 12th architecture biennale in Venice. And, four months later, Im on a boat heading for the Giardini at 10:30 p.m. under a full moon. My brother and I have been working extremely hard since April on the exhibition design and contents with the project team (designer Jurgen Bey, visual artist Barbara Visser, NAi curator Saskia van Stein, and graphic designer Joost Grootens). The keen discussions about ideas, and especially the nightmares about fire-safety certificates and structures that exert 15 times too much force on the walls of the pavilion, are behind us hopefully. Im really curious to see how it all looks. The construction crew has been here for a week already. I arrive at the big exhibition construction site inside the pavilion at about 00:30 a.m. Some of the team who couldnt work here during the day because of the noise are working now. 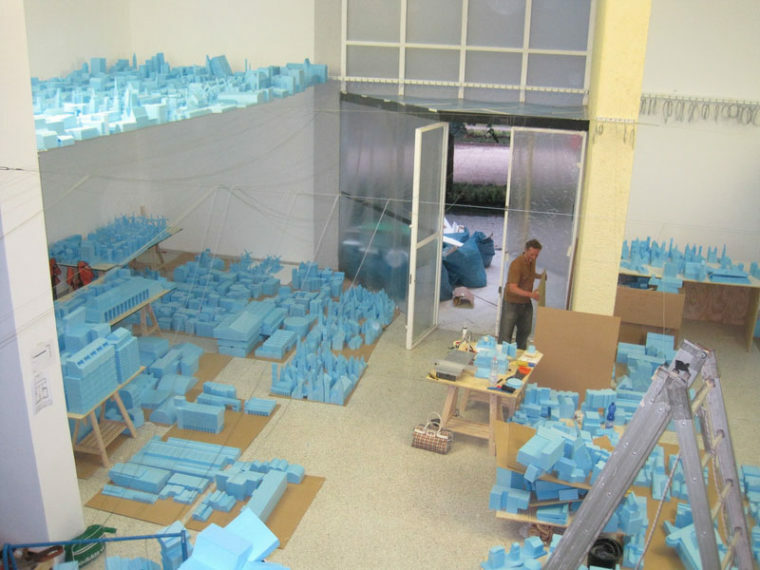 Huge boxes containing almost 5000 foam models of buildings are scattered around. Structures, scaffolds, steel cables, a huge amount of material. The stairs are in place and are just as sturdy and spacious as Id hoped. Some of the cables are pulled tightly and the first models are hanging! The start looks good, but Ive the feeling were behind schedule. Im worried we wont be ready in time for the opening on Friday. Barbara (Visser) is heading a group of three who are working on the Placebook Panorama. In a very subtle way she is depicting the key ideas of our appeal for mutual interaction and influencing between science, technology and the creative industry. The six-member project team has amassed a huge network of people, buildings and pressing social issues. Thousands of small nails have been hammered into the rock-solid rear wall at the stairs, and wires have been stretched between them. 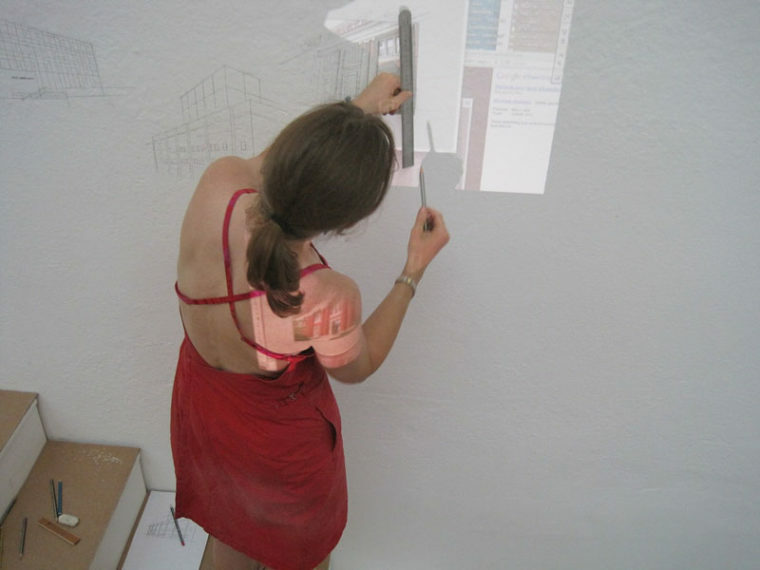 Even at this late hour she is able to make extremely careful pencil drawings on the rear wall. At 3 a.m. I head off to bed. By 8 a.m. the next morning its already scorching hot and very busy in the pavilion. A team of twenty people are moving all around, and then theres the incessant drone of drills and saws in the pavilion. Earplugs are a must. Despite the conditions, the atmosphere among everyone  the construction crew from Landstra en de Vries, the project team, the NAi staff and our own personnel  is very good. A quick visit to the neighbouring pavilions and I see that Belgium and Italy are more or less finished. My brother and co-curator Erik arrives. He, too, has mixed feelings. It could be very beautiful but were behind schedule if we want to get the composition of the empty city right. Will we make it by Friday? More importantly, will it all hang perfectly? Some of the construction crew are good cooks and they prepare a wonderful Italian lunch. Theres just one annoying factor these days that affects everyone: bloodthirsty mosquitoes. My wife phones to say shes lost her passport and has to get hold of an emergency passport. Shes not sure if thats possible in time for her flight on Thursday. It would be terrible if she misses the opening on Friday. As always, Saskia (van Stein) knows a good terrace for dinner. Afterwards, we work with her and six others until about 1:30 a.m. A good atmosphere again, especially after all those carafes of wine with the food. First thing early in the morning we have a short meeting with the construction crew and Jurgen (Bey), who arrived yesterday afternoon, to think of a faster strategy to sort and hang everything. Good thing hes here now, the eternal optimist. What a genial character. He has lots of experience and a solution for everything. Thats something I  the stubborn curator some people are calling me  can learn a lot from. Its fine to be working throughout the project with people of that calibre. Suddenly the jury for the national pavilions arrives. We werent expecting them until much later, but theyve decided to visit us first. The models are sagging like decorations left hanging after a party; its all a big mess of boxes, noise, dust, etc. Whats more, the pavilion is completely full instead of empty, which it will be when were finished. Ive been on a couple of juries in recent years and I know that jurors are accustomed to looking at something not yet finished. But I dont know what Id think if I had to walk around this mess and couldnt quite imagine how and what the finished display will be like. The jury departs after a short and interested conversation and we quickly get back to doing what weve wanted to achieve from the start: make an exciting exhibition display that conveys the concept in a powerful and poetic way. The revised working method of construction crew and designers is bearing fruit, for now there are 30 people available and were starting to make up lost time. At last theres a little more space in the pavilion to sort out the models. Lots of visitors enter the pavilion and find their way between the models to see whats going on. In the meantime the Dutch Atlas of Vacancy arrives. In addition to his contributions to the project team, the book reveals the skill of Joost (Grootens) once again. The book is truly a marvellous graphic presentation about vacancy and possible future uses. The result of the research by our office acquires additional power in this atlas. Construction work is not our profession. Despite optimistic estimates from others, we sensed right from the start that it would be difficult with the pavilion walls. Our chief builder Bouwko Landstra points out that we cannot pull the cables any tighter or else theyll literally pull the walls down! With the exception of the rear wall, the pavilion is built of hollow Italian blocks covered with a layer of plaster. But thankfully the sea of buildings is hanging well now. By noon, the cables are pulled as tightly as possible. Bouwko is turning the hundreds of spanners like a DJ. The pavilion is tidied up. Empty! 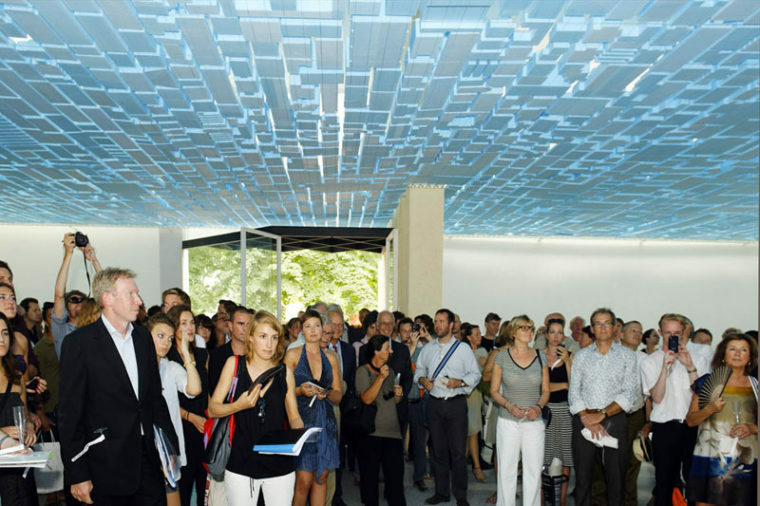 Its amazing to see that the installation, as we hoped, interacts with the architecture of Gerrit Rietvelds pavilion. 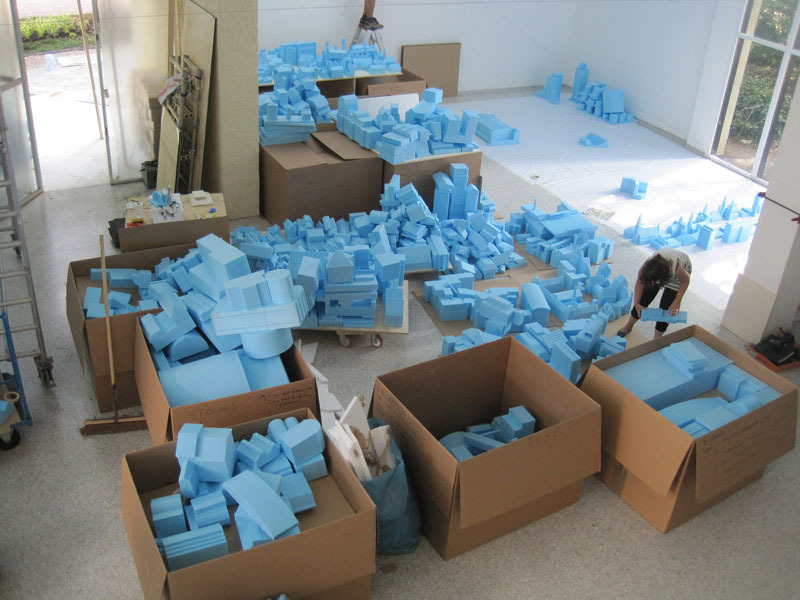 The clear blue colour of the foam in particular is well chosen. 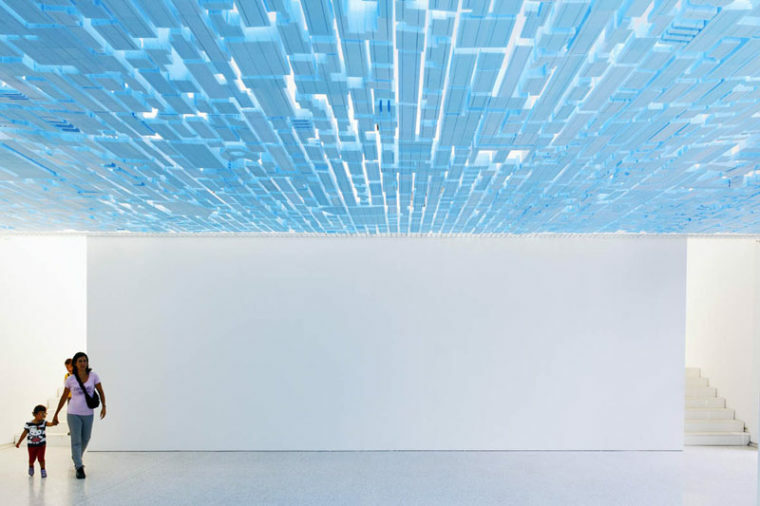 The blue works wonderfully with the light inside the pavilion, which changes throughout the day. The Placebook Panorama on the wall above the steps is also finished and looks great. The international press (The Guardian, Wallpaper, Designboom, etc.) knows the way to our pavilion and seems fascinated by all elements of the installations We drink a bottle of Prosecco with all the team members. Nicoles emergency passport is ready on time. She arrives with Eriks girlfriend Danielle. Everything is ready for tomorrow…. Lots of press and interviews in the morning. We also have to do some last-minute work on the installation, straightening models that have fallen. NAi director Ole Bouman is pleased with the result but wants to add an appealing question to the image on the rear wall. And so we have a couple of minor things to attend to before the opening. During the opening Im pleasantly surprised by speaker Cor van Zadelhoff, who admits guilt about vacancy. Yet Im a little annoyed too, because the speeches are again all about those eight million square metres of empty office space, while our plan is primarily about the thousands of inspiring government buildings and buildings with public functions (churches, bunkers, water towers, hospitals, forts, lighthouses, prisons, schools, the unused house of Mayor Eberhard van der Laan on Herengracht in Amsterdam, etc). Such buildings normally are not located in business parks but right in the middle of the city, village or countryside. Whats more, the speeches dont acknowledge that were talking about temporariness as a strategy, about making use of the in-between time, the period between vacancy and redesignation. The Hembrug site in Amsterdam, containing 150 government buildings, has been the subject of meetings about redesignation for a decade, but almost nothing has happened! What were talking about is the potential of temporary laboratories for the creative knowledge economy and the possible contribution to the national knowledge-innovation agenda. I resolve to stress this even more explicitly this Saturday morning during our own presentation. The response from visitors and press is very positive. Some visitors question whether the introductory text on the wall is really necessary. For the average visitor, the objective of the exhibition is as clear as daylight luckily. But admittedly, to fully understand the project it is advisable to read the curatorial statement in the Vacant NL booklet. During the evening dinner Ole Bouman thanks the whole project team one by one. And rightly so, for Vacant NL is a team achievement par excellence. The exhibition Vacant NL: Where architecture meets ideas is on show in the Dutch pavilion during the 12th architecture biennale in Venice until 21 November. Communications: Rinske Brand, Elsbeth Grievink.